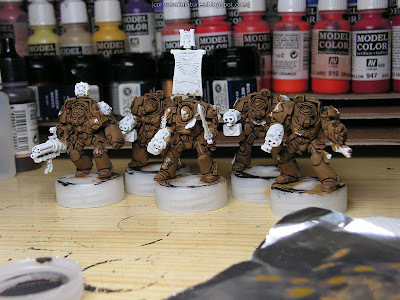 As mentioned in previous posts (this one for example) I'm painting up a unit of Deathwing Terminators for the online painting competition at Bolter & Chainsword. 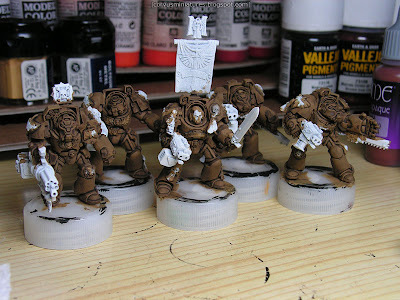 Basecoating and shading is done on the unit. I've used quite some bits from the Dark Angels upgrade sprue together with some icons made with my green stuff press mold technique. That is a smart looking brown. Good luck with the competition and keep the progress pictures coming! The craziest painting competition ever?